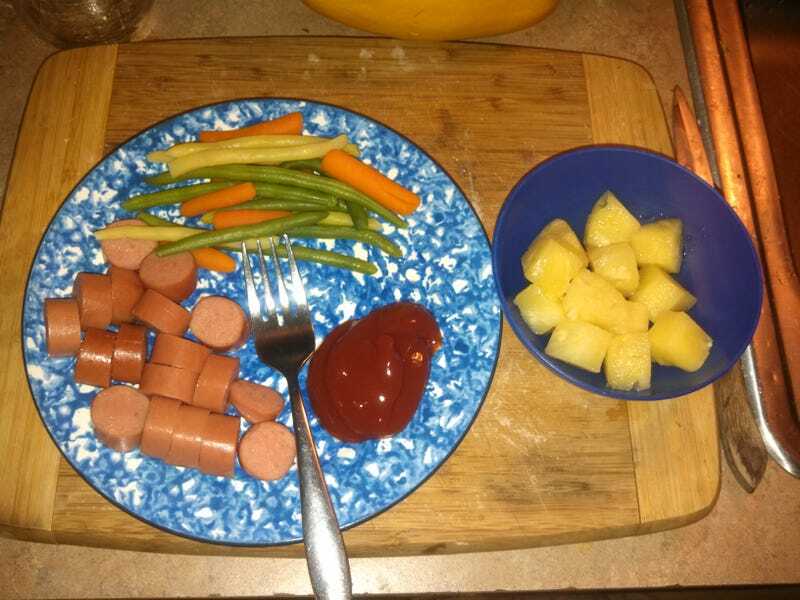 For the gluten free kids, we have 2 hot dogs apiece with ketchup, a mix of green and yellow beans with baby carrots, and pineapple chunks. My 9 year old is already done and grumping that he's hungry again... kid must be hitting a growth spurt! He's going to have a package of his garlic and veggie Thai noodles. For the myself and my 12 year old, we have pizza rounds, veg, and he got the rest of the pineapple. (Pic below.) I get the juice from the can :) Pizza rounds are what i call these odd little dough, cheese, and sausage rounds that I found lurking in the freezer under the bag of beans and carrots, and I topped them with jarred pizza sauce. They're ok. They came from the food pantry a few months ago (we get them a few times a year, in an unmarked bag with no directions or anything), and they're always amoung the last things to get used. The TeenChild and his girlfriend made themselves a box of Mac and cheese, plus she brought chips and junk for them. I cannot wait until Sunday, when I can (hopefully) go shopping. If my car cooperates, that is. Damn cold weather. I have my fingers crossed that Big Betsy will make it through the winter, but it's looking pretty iffy. She's stalled out and died several times this past week, even though there's gas in there (a little, but should be enough). If we can just make it to tax time, we'll be ok. I'm watching the cat sit next to my 10 year old and lick his lips, waiting for him to finish so he can lick the plate. Goofy beastie. The kid is paying more attention to The Magic School Bus than he is to dinner!